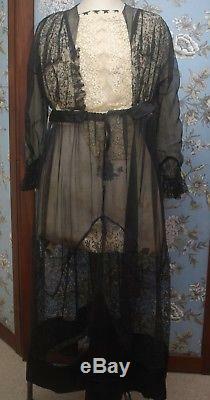 This beautiful Edwardian era antique black lace dress has an ivory/cream lace bodice with inset cream net sleeves. The waistband once had a cream silk underskirt stitched to it, but the original fabric perished, so a new, replacement petticoat will now be needed to wear under the garment. Although if you are brave it can be worn as is. Approximate measurements as follows: Dress length 48", bust 34/36" maximum, waist 28/30", this is a high waist style, shoulder to shoulder 16", sleeve length 21" with cuff width of about 4/5". The skirt width is about 32", about 64" all round. 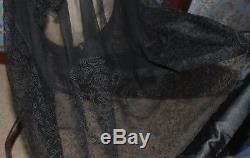 The dress, including the black Tambour? 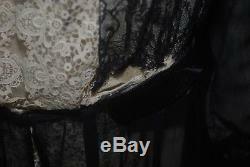 Lace appears to be mostly hand-stitched, and although there are signs of alterations and some small imperfections, the dress is still very wearable, and is generally in good condition. Please take time to view all of the photos as these are the most useful part of the item description, but please read my written condition report too. 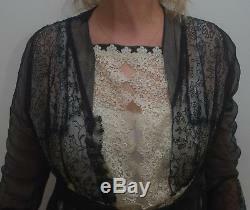 The item "Beautiful Titanic Era Black & Cream Inset Bodice Lace Dress Sheer Skirt 8/10" is in sale since Saturday, October 27, 2018. 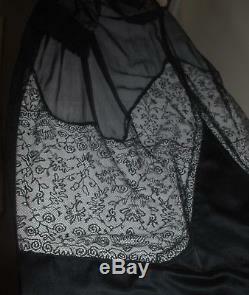 This item is in the category "Clothes, Shoes & Accessories\Vintage Clothing & Accessories\Women's Vintage Clothing\Dresses". 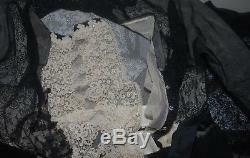 The seller is "littledonkey01" and is located in Haverfordwest. This item can be shipped worldwide.